Thule Air Base is located north of the Arctic Circle on the northwest side of Greenland. It is the most northern base of the USAF. The 821st Air Base Group serves as host unit and is responsible for support operations for "Team Thule," the multinational personnel force stationed on base. The 821st also maintains and operates missile warning and space surveillance sensors for the 21st Space Wing. Additional units on base include the 12th Space Warning Squadron and the 23rd Space Operations Squadron. 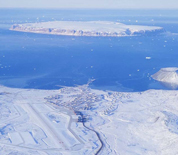 Thule is a hub for aviation and shipping operations that service other nearby installations, thanks to it's 10,000 foot runway and deep water port. There is a tugboat assigned to the base to assist ship movements and also provide daily sightseeing tours of the Northstar Bay. This Thule AB directory features the critical info you’ll need to navigate through the many facilities and recreational opportunities available on base.